This is how I keep my workout motivation! A few weeks back I posted a quick tips article about workout motivation. I stared at my calendar this morning and thought I would write a bit more. So the picture at left is the calendar I use to track my completed P90X workouts. Yeah, there are a few blank days, I was sick and didn’t have the strength or focus. I see the calendar (and this month, Abel Alboneti) every time I’m on the main floor of my townhouse and I walk by it every time I hit the fridge or snacks. I’m reminded each time that I want my beach body, I want my abs back, I want stronger muscles, and now, the most important reminder appears on the calendar: that I have already put a lot of work into my physical fitness. I’ve invested in myself in such a way that I don’t want to go back. This doesn’t change that I have also become lax at getting up at 6:00 sharp to work out. It also doesn’t change that fact that sometimes, halfway through a workout, I want to just quit for the day. This is a new challenge I face, and it’s one that I have to overcome. When I look at my calendar and it bugs me that I’ve missed 5 days this month due to illness. 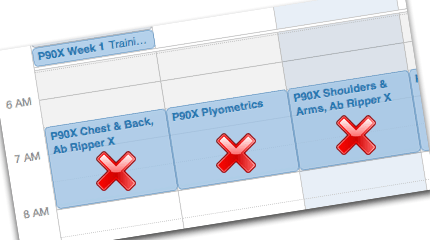 So although I officially end P90X on March 10, I will add those missing days as I continue and prepare to start P90X2. Knowing that several friends and my boyfriend, Tim, are also (re)starting P90X for their own reasons, or as I found out, “because, Damien, you’re living proof that it works,” inspires me to continue working toward my fitness goals. Week 1 of P90X seems so long ago! I have never done something like P90X before, and I am so glad I decided to do it. And I’m really glad that I will be able to say I completed it on March 10, 2013. PS, if you’re astute, you noticed that I haven’t worked out yet today. I’ll do so after work today.